Hoping to continue the legendary success of its predecessor, On Any Sunday, The Next Chapter, is set to debut in theaters across the world beginning November 7, 2014. The documentary has a connection to the original On Any Sunday. It's directed by Dana Brown, the son of Bruce Brown who directed the original. Dana Brown has directed Step Into Liquid (2003), a surfing movie, and Dust to Glory (2005) about the Baja 1000. Produced by Red Bull Media House and Freeride Entertainment, it's displaying at theater chains such as Regal Entertainment, AMC Theatres, Cinemark, and Carmike Cinemas. The film is meant to be a follow-up to the 1971 Academy Award-nominated documentary, featuring today's motorcycle superstars, including MotoGP riders Marc Marquez and Dani Pedrosa, action sports superstar Travis Pastrana, freestyle motocross pioneer Robbie Maddison, Pikes Peak International Hill Climb motorcycle champ Carlin Dunne, women's motocross champ Ashley Fiolek, motocross legend Doug Henry, custom motorcycle designer and former racer Roland Sands and one of the most successful riders in supercross history, James Stewart. "This is the first time a feature film from Red Bull Media House will have national theatrical distribution in the United States," said Werner Brell, Managing Director of Red Bull Media House North America. "Releasing the film nationally gives us the opportunity to reach new audiences and excite those who ride, where they ride." On Any Sunday, The Next Chapter captures what it means to ride in the United States and abroad. The first feature film from Red Bull Media House shot entirely in 4K Ultra HD, the action and emotion are breathtaking: phenomenal athletes, revolutionary innovators, Hollywood stars and even visionaries who use motorcycles to save lives. 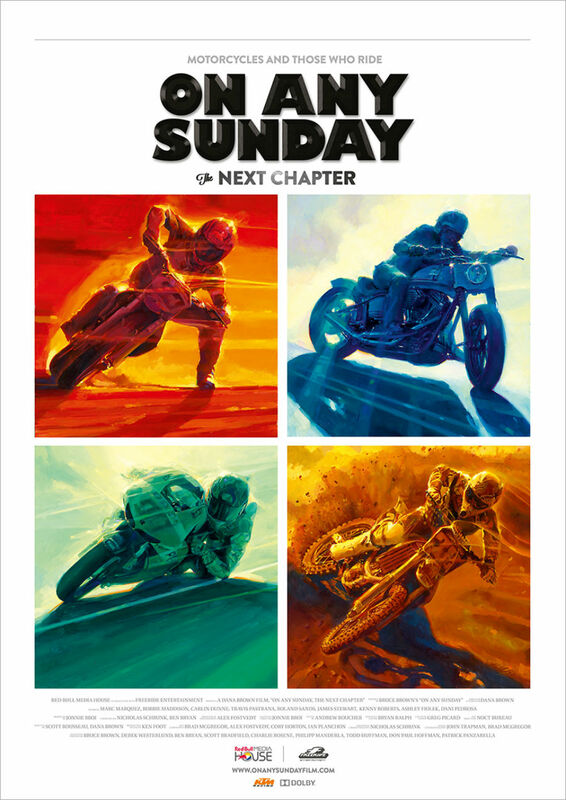 "On Any Sunday, The Next Chapter" is an exploration into the pursuit of excitement, passion and life in the world of motorcycle riding. "When Red Bull Media House was looking to do a feature film on motorcycle riding, the first people we wanted to work with were the Browns," commented Scott Bradfield, Head of Production and Development for Red Bull Media House North America. "The storytelling legacy that Dana Brown brings to why people ride is apparent in every aspect of the riders he documents in 'On Any Sunday, The Next Chapter.'" Director Dana Brown suggests that the timing was just right for a follow-up to his father Bruce Brown's film, "On Any Sunday": "Bikes are better, athletes have progressed, and there are so many disciplines now. In fact, we couldn't possibly do justice to all of them in this 90-minute movie. We set out to show a cross- section of motorcycling today, and here's hoping we've succeeded." The film will be premiered in the Dolby Atmos® multidimensional sound experience at the Dolby Theatre® in Hollywood on Wednesday, October 22 where part of Hollywood Blvd. will be shut down for a one-of-a-kind motorcycle cruise-in. Dolby Atmos makes it easy for filmmakers to place or move specific sounds anywhere in the movie theatre, including overhead. For media credentials to the premiere, please reach out to the contacts below.